Where did this past month go?????? I have been so busy both at work and at home. One of my sisters came home for Christmas for the first time in 30 years! Three of the four of us girls were together for 8 days! Shopping and laughing! What fun! Maybe someday all seven of us can get together for Christmas sometime! I once again made all of my Christmas cards. 67 of them! And I made them all in a week! Oh my! I made a pretty simple design this year. I had seen a similar card on Pintrest, but changed things up a bit!. I created a couple of layers of different paper and framed them with different colored paper. I embossed the base layer with and then added the layers. 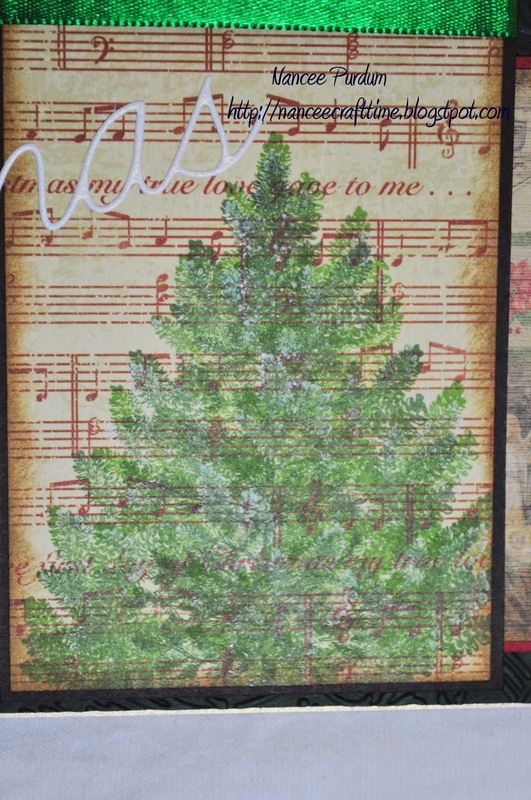 I used two different stamps from Stampin Up to create the tree. Using two different greens and some white I was able to give the tree some depth. 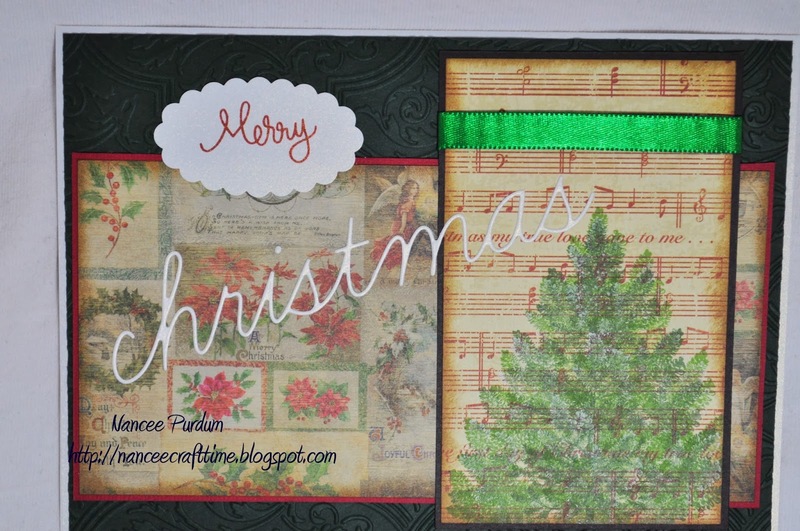 I used the “Christmas” die from Memory Box and a stamp from Stampin Up for the “Merry”. My paper is from The Paper Studio. My ribbon is from my stash. I used distress ink to “age” the paper. I wanted a more vintage look to my card. One final look. . . . . . . .
oh wow! 67!!!! WOW Nancee that's amazing! Pretty card and it sounds like you and I are both from large families! Glad you had a wonderful Christmas! Happy 2014 to you! 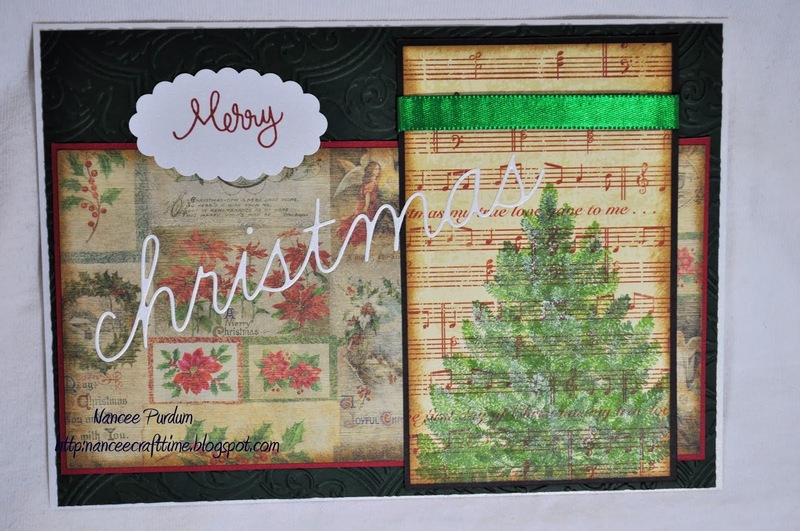 O Christmas Tree, O Christmas tree…what a delightful card or rather 67 cards!!! I'm so impressed that you made them all in just a week! Sounds like your christmas with your sisters was fabulous and what memories you have! Happy New Year! Very pretty card! 67 is a lot of cards. WOW! Happy New Year! Your card is just adorable! OK, ALL of your cards are amazing! You were a busy bee! I just love the tree! It is gorgeous! You've imspired me! Keep the cards coming!